2018 Mehuhin Competition Junior Finalists. 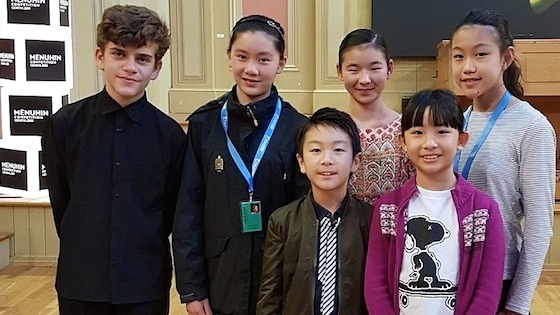 Image courtesy the Menuhin Competition. Junior Division Finals will take place on Friday, after which the Junior laureates will be named. Here is a list of prizes that will be awarded. The biennial Menuhin Competition, which was started in 1983 by violinist Yehudi Menuhin, is open to violinists younger than age 22 and has two age divisions: Junior (under age 16) and Senior (ages 16-21). The Senior Semi-Finals will take place on Wednesday, with Senior Finals on Saturday. This year's competition drew more than 300 applicants worldwide, with 44 violinists representing 17 nationalities chosen to participate in the live competition. This year's jury includes Pamela Frank (chair), Joji Hattori (vice chair), Itamar Golan, Ilya Gringolts, Henning Kraggerud, Lu Siqing, Maxim Vengerov, Soyoung Yoon and Josef Spacek. April 18, 2018 at 07:08 AM · I was very impressed by all of them, but I particularly enjoyed Guido's. Kudos for taking a different road and nailing it. I will pay attention to his career. I think he is going to bring new things to the violin world. April 21, 2018 at 01:48 PM · Guido is really a very promising talent and deserves all attention to a brilliant career. April 21, 2018 at 01:52 PM · Guido is really a very promising talent and deserves all attention to a brilliant career.